5 Amazing Packing Tips That Make Moving Easier! A professional mover’s advice on what you should do before you start packing for your move. Try These 5 Amazing Packing Tips Before You Start Packing For Your Move! Moving for a living gets you really good at, well, moving! There are a ton of useful packing tips and valuable insights we’ve gained over the years, that we’d now like to share with you! Our curated guide on “what you should do before you start packing for your move” elaborates on our previous post “30 Tips from a Professional Mover” covering everything you need to know to improve your packing skills. With the following guide, you’ll find out the easy way that a little bit of thoughtful preparation goes a long way. The first logical step before packing your home for a move is to declutter it. There’s no sense spending your time packing, or paying a mover to pack a bunch of stuff you don’t want. It’s simple mathematics; The less stuff you got, the less you’ll have to pay to pack and move it! Here are a few tips to get you started on decluttering your home. A garage sale is the perfect way to eliminate your unwanted stuff, and if you're lucky, make a little bank in the process. 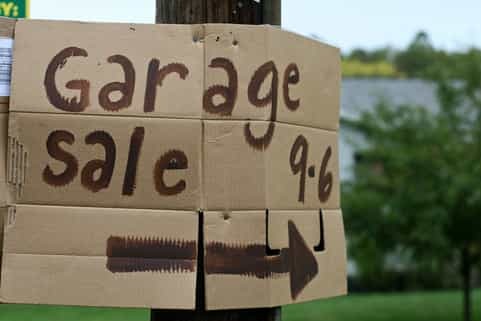 While having a garage sale in Toronto doesn’t require any special licences or permits, there are a couple by-laws you’ll want to follow to avoid a fine. Firstly, in Toronto, you’re allowed two garage sales per year. A single garage sale can span two consecutive days. Second, displaying garage sale signs is permitted from 5 pm the day before your garage sale, until 7 am the day immediately following it. For the condo or apartment dwellers out there, here’s an excellent article from TorontoRentals.com, on how you can still have an awesome garage sale too! We can’t stress this point enough. Get all the unnecessary stuff out of your way before you begin packing! Start with the small stuff; cupboards, drawers, closets, etc… Get a hold of some good quality contractor grade garbage bags and have at it! If the garbage you create becomes more than the you can throw out curbside, there are a few sensible options to remedy that; The city of Toronto calls them “Bag Tags”. They’re essentially “permission slips” you can buy from the city, that permit you to throw out excess garbage. Garbage Tags are available for purchase online and at Toronto Shoppers Drug Mart and Canadian Tire locations. You’ll pay about $5 for every bag of garbage beyond what fits in your bin with the lid closed. RoadRunners Does Junk Removal Too! A locally-owned bin rental company in Scarborough providing quality service to homeowners and commercial clients in Toronto and surrounding areas with 30 years of experience. Bin There Dump That is a bin rental company in Toronto that provides residential friendly bin rental services for homeowners and business looking to get rid of unwanted junk. Looking For The Nearest Garbage Dump in Toronto? Here's A Map. Here’s a detailed list of waste management facilities in the GTA where you’re able to dispose of excess garbage. Click an item on the map for contact information, hours, and details about what exactly you can, and can’t throw away at each location. Donations in the city of Toronto are always in high demand. There’s never a shortage of organizations and charities happy to accept your old clothing and household items. Instead of simply throwing your stuff away, help divert it away from our landfills in a positive way. This isn’t just an excellent means of decluttering your home, it’s good for the environment, good for your community! Many donation companies will actually come to you to pick up the items you have to offer! Need A hand moving stuff? With several locations around the GTA, and the ability to accept just about anything you can think of, This “for profit” organization makes for a great and convenient option for your donations. An in-depth list of what items can, and can’t be donated to Value Village can be found here. The city of Toronto provides a slew of alternatives to just throwing away your stuff. In addition to the usual furniture and clothing donations, you can also donate your time volunteering. and helping your community. There are a variety of ways you can get involved, listed here on their website. For more than 50 years, the Toronto Fire Fighters Toy Drive has been working to help families in need. When ‘Operation Christmas Tree’ was born in 1961, Toronto Fire Services helped more than 1,200 disadvantaged children throughout the city of Toronto. You can donate new, unwrapped toys at your local Toronto fire hall year round. With help from the community, they help thousands of families celebrate Christmas each year. Find out more here! This non-profit organization collects gently-used furnishings from the community and distributes them to families in need for free. Furniture Bank assists the homeless, victims of abusive, newcomers to Canada, refugees, and more. Donations can be made at there Kipling and Queensway location, or for a small fee, they will come to you for pickup. Find out more here! There’s a lot of different packing products to choose from when moving. You won’t need them all, and you don’t have to break the bank to pack your stuff safely. There are however, a few key essential packing supplies you shouldn’t be without. A good quality packing tape is indispensable! And with a good quality tape dispenser, easily dispensable... Jokes aside, bad tape is an unsuspecting, but very common source of damage during a move. Adhesive on inferior tapes fail; especially in cold weather, leaving the contents of whatever box it was holding together, broken on the floor. Do yourself yourself a favor, and invest a few dollars in a quality packing tape. Although it may seem like a good idea, never use the following tapes to seal a box! Duct tape, masking or painters tape, and electrical tape don’t work well on cardboard, and will completely fail in the cold. A less costly alternative to bubble wrap, and extremely versatile packing supply. Packing paper should be front and center throughout the packing process. Suppliers typically sell it by the pound, and as a general rule, a one bedroom apartment will go through about 10 pounds of the stuff. For each additional room in your house, add 10 more pounds… So a two bedroom needs about 20 pounds, a three bedroom 30, and so on. Packing papers primary job will be protecting your glassware and other breakables, but can also be used very effectively elsewhere; such as filling empty space in your not-quite-full boxes, or making a temporary container for the loose items in your junk drawer. Used properly, packing paper can effectively protect everything you pack during a move. Ensure your boxes are filled completely to the top. Unfilled boxes will crush and deform much more easily than full ones, causing damage. If finding the last few items to fill a box becomes difficult, you can use a filler, like packing paper, cushions, pillows, or blankets to fill the left over space. This isn’t a must-have item when packing, but is useful for protecting your heavier fragiles. Items like stereo equipment, electronics, vases, planters, etc… can all benefit from a few layers of bubble wrap before they’re placed in a box. A good quality Sharpie will do. When labeling your box, try writing directly on the tape you sealed it with, and not on the actual cardboard itself. It will make your markers last longer, and will keep your boxes free from confusing labels, the next time you move. The use of special labels and stickers can be quite useful for quickly identifying a box as “fragile” or “open first”. Specialty tape, like the one pictured here, is much more easily seen than its handwritten counterpart. A lesser known, but great source of free boxes is your local pet store. What’s great about them is they’ll typically have larger size boxes available due to the size of the items they sell. Perfect for moving. A common source of free boxes. There’s almost always available for pick up in large quantities. One caveat however; liquor boxes do not make for an efficient pack or move. They’re smaller, so don’t hold much, and when there’s a lot of them, it can take forever to move. Use them sparingly if you must. Another great source for free boxes and moving supplies is on-line. A quick search on websites like Kijiji, Craigslist, Facebook Marketplace, and letgo, will usually get you what you need.. Located at 40 Continental Place in Scarborough, This moving supply store carries everything you could possibly need when moving. Overpriced for most of their moving supplies, but a convenient source none the less. We don’t recommend buying anything other than boxes from them, which seems to be the only sensibly priced moving supply they sell. Shrink wrap, tape, bubble wrap, wardrobe boxes, and packing paper are all available here, but for way more than you’ll want to pay. Looking For More Helpful Moving Tips?